Check out our Featured, Featured College Football Free Picks for similar articles. Louisville is coming off a less than impressive 24-14 victory over Duke last week but I’m not expecting it to stall against the Wolfpack here. N.C. State fell just short in overtime against Clemson last week – a valiant effort on the road against the undefeated Tigers. We were behind the Tigers in that game and while they never sniffed an ATS cover, I still feel that we deserved a better fate. Clemson marched up and down the field all afternoon but simply couldn’t finish enough drives with touchdowns to ever pull away. Credit the Wolfpack for hanging tough in that one, but they’ll face a tougher test here as the Cardinals stay home and aim to keep piling up victories. 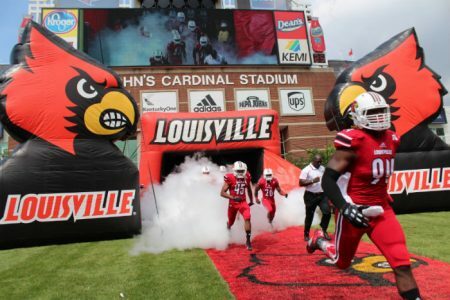 Note that Louisville will be playing only its second game in the last three weeks so it should be fresh. Meanwhile, N.C. State is coming off back-to-back slugfests over the last two weeks (prior to the Clemson game the Wolfpack defeated Notre Dame by a 10-3 score). While the Cardinals are known for their offense, I look for their defense to set the tone on Saturday as they ultimately deliver a convincing win over a quality opponent. Take Louisville (10*). The defending champions are rolling, coming off back-to-back blowout wins on the road versus Arkansas and Tennessee. With their “air of invincibility” firmly intact, I think they are due to suffer a let down here against the Aggies. Texas A&M is coming off a bye week, allowing them to put everything they’ve got into preparing for this game. Alabama is asked to cover an enormous spread here at home, even greater than the 18-point margin they defeated the Aggies by last year. Texas A&M is a far better team since the addition of Trevor Knight at quarterback, and the former Oklahoma Sooner has accounted for 12 touchdowns in four games in conference play. The best game of Trevor Knight’s career came in the 2014 Sugar Bowl, throwing for 348 yards and four touchdowns in a 45-31 win over Alabama. He’s got a talented group of wide receivers here at A&M, and one of the best defenses in the country behind him. Don’t be surprised if history repeats itself here in Tuscaloosa. Take Aggies. Arkansas has a reputation in the Brett Bielema era of being a pure smashmouth, run first squad. Part of that is true this year – the Razorbacks can certainly play some power football in the trenches – their top two backs are averaging close to six yards per carry between them, despite having faced TCU, A&M, Ole Miss and Alabama already. But the key to this bet is Hogs junior QB Austin Allen, who has superseded his older brother in his first year as the starter. Allen is averaging 8.5 yards per pass, with a 18-6 TD-INT ratio and a 64% completion rate. He threw for 400 yards and three touchdowns against Alabama, but he threw three of his six interceptions on the year in that ballgame. No shame in that – Alabama’s defense is loaded with future NFL players. And he followed up that showing against the Crimson Tide with another three TD effort against Ole Miss last week. Arkansas has seven different receivers who have caught a 25+ yard pass this year, and their top three guys have at least four touchdown catches each. The markets are down on Arkansas. After all, r ‘Bama whipped them on the heels of a three TD loss to Texas A&M in a previous ‘step-up’ game. But make no mistake about it – that A&M final score was as misleading as it gets. The game was tied at 17-17 late in the third quarter. Arkansas put together a 15 play, 89 yard drive, but they were stuffed at 4th and goal from the 1 yard line. Two plays later, A&M hit a 92 yard TD strike and the rout was on. Had Arkansas gotten that single yard, they might well have won that game in SU fashion. Instead, they’re being priced like a team that can’t step up in class, despite that SU win over the Rebels last week. Auburn is on a 2-6 ATS run as double digit favorites, the two spread covering wins coming against Arkansas State and Louisiana-Monroe. They’re getting a ton of credit in the betting markets for their supposedly improved play following three straight wins, all over VERY flawed opponents. Last week’s bye leaves the Tigers as the fresher of these two squads, but freshness alone does not equate to a victory by double digits. The Hogs won in quadruple overtime over Auburn last year, and I’m expecting another hotly contested battle this time around. Take Arkansas. So there you have it, our three best expert college football free picks for October 22. Enjoy the games, and best of luck with all your college football betting.